If you have every word of every song from Disney’s Frozen memorized then you probably have Frozen at the top of your Christmas gift list. 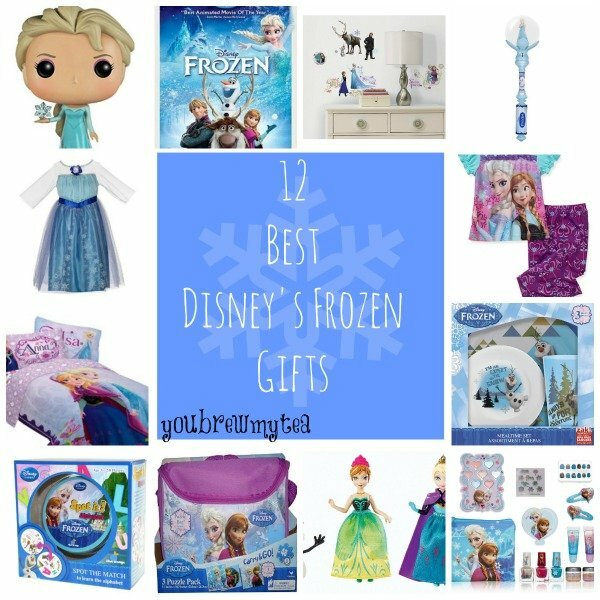 I have rounded up my top 12 Best Disney’s Frozen Gifts for you, some we have already and some are on my list. You are sure to find something for your little snow princess here! 1.Elsa Funko Pop Figure– We love these fun vinyl figurines and Elsa is at the top of our list this year! 2.Elsa Dress– Every princess loves to dress up as the reigning queen, and Queen Elsa is the one to be. 3.Frozen Celebrate Love Comforter Set– Transform your little girls room into a pretty Frozen sisters landscape with this bed set. 4.Frozen Spot It Game – This alphabet edition of the fun Spot It Game is a great teaching tool that features your favorite Frozen characters. 5. Frozen Puzzles Pack– 3 themed puzzles that come in a grab and go Frozen drawstring bag for fun on the run. 6. Disney Sisters Gift Set– These sweet sisters are perfect for dramatic play, or maybe even a sensory bin? 8.Olaf Mealtime Set– Make eating more fun with this Olaf Set of dishes with a plate, bowl, and cup. 9. Elsa and Anna Pajamas– Pretend play doesn’t have to stop at bedtime, she can drift off to dreamland in a cute pair of Frozen themed pj’s. 11. Frozen Vinyl Wall Clings– Peel and stick vinyl figures make a great way to change up the theme without a permanent or costly redo. 12. Frozen DVD– If you don’t already have the DVD you must add it to your collection, this one comes with a Blue-Ray, DVD + digital copy- perfect for rides in the car. Grab one or all and make your little Elsa or Anna fan thrilled this holiday season! These best Disney’s Frozen gifts are a hit with all the kids these days! Don’t forget to make sure you have the movie on hand especially! Celebrate your first snow this season with these gifts and others! What is your favorite Frozen Gift idea?